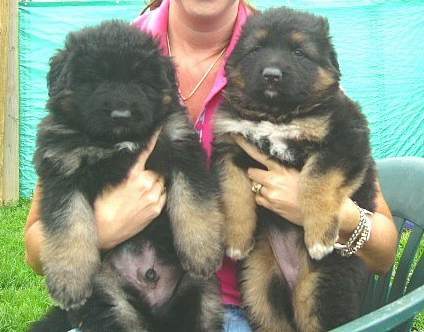 Large German Shepherd PUPPIES FOR SALE. 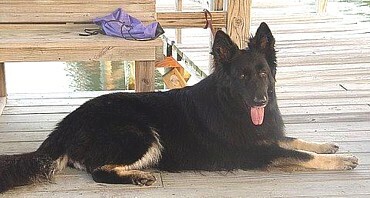 Dakota boy at just 10 months old in FL. Stormy/Bear puppy. 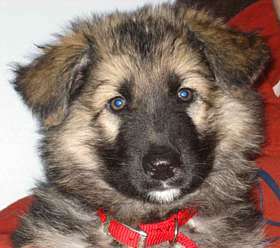 CLICK 'below' to enter my website with 100's of pictures of my breeding girls, boys and past progeny as well as 'NEW PUPPY PICS'. And will need to ENTER on one more page. "Dakota is very striking and majestic looking. Strangers stop in their tracks and gape at him. People from around the world who are visiting this area stop and ask if they can take a photograph of him. Heads turn all the time! We walk in a popular area where there is outdoor seating at a restaurant and the peoplel sitting inside as well as outside all turn their head as we walk past. It's quite a phenomenon. One of the other things that stands out to people is how calm he is. He is so self-assured and well grounded that at the daycare where he sometimes goes, they said that Dakota is the first dog they introduce a new comer to if the new comer is nervous. This is because Dakota is not agressive, not afraid, not excitable, etc. Dakota is sort of a gentle leader. But he still is a puppy! He's wonderful. I brought Dakota to R's work a few weeks ago. All of the Sheriff's Office Deputies were standing around in the lobby gathering for a meeting. R was sitting in a chair and picked Dakota up and put him in his lap like we do at home all the time. Dakota, as he always does, just splayed his legs apart, rested his big head on R's shoulder with his tongue hanging out of his mouth and just chilled there. Everyone was in awe!! 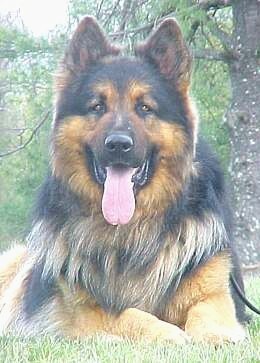 Such a big and imposing looking Shepherd being so trusting and calm!! We couldn't be happier! Robyn" FL. Mr. Kizer - Stormy(Soki/ Sammy)/Mikki(Pippi/Toby) boy. My most precious Daisy at 8 years old. Jenna. 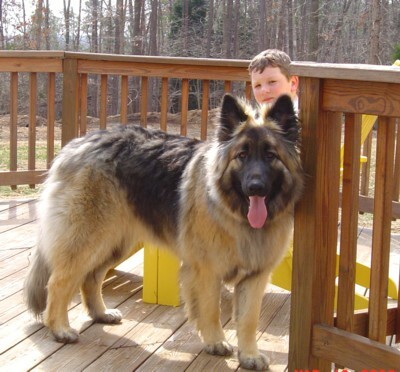 Summer/Mikki at just 14 months old. Wow,what an experience!! I went to visit Sandy with one of my friends, Kari Keller, who has two of her dogs, Kizer and Gris-Sel and was very impressed! I was amazed at what I saw!!! It was as if I was in the presence of the female version of the Dog Whisperer! Had I not have seen it with my own eyes, I would have never believed one woman could manage such a large pack of dogs and do such an incredible job. I could not believe how many HUGE dogs were all together with everyone friendly and getting along so well. Very impressive! In addition, there were a few energetic adorable puppies biting and chewing on the big guys with no troubles. Her dogs are absolutely gorgeous. She, as a breeder/trainer, works with each animal to socialize them and lay a good foundation for their future homes. Her dogs are sound in mind and body. 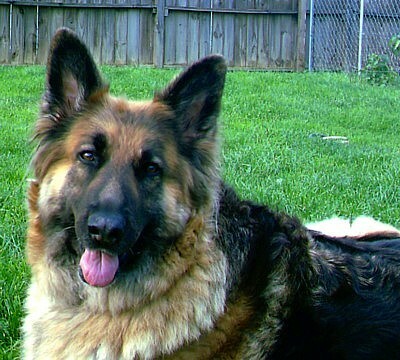 I have owned and worked with German Shepherds for 20 years and can recommend her dogs without reservation. Sandy, thanks for being such a great hostess and allowing us to spend time with you and all of your wonderful dogs! Griz at 2.5 years. Not full grown yet. **FOR SALE: Adults. ASAP. 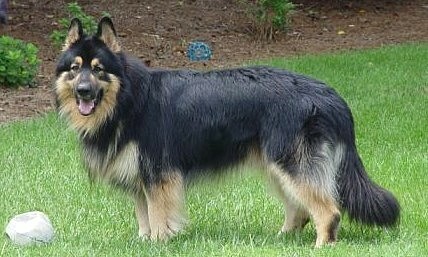 I need to only keep 3-4 dogs due to family members health issues. 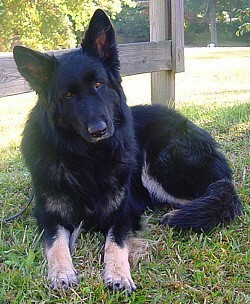 Looking for loving home: Long haired german shepherd Young Adult Male (29"+) & Female. 3 & 5 years old. ALSO: 10 month old female. And 1 year old Male & Female (red sables) I have decided I need to let go as well. Serious PHONE inquiries only please. No Shipping. Located in WV. Click here for ADULTS. 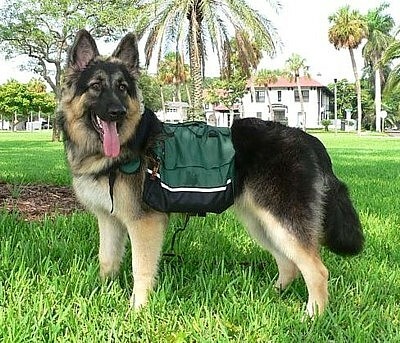 Girls should go w/boy doggies or no dogs and boys should go w/girls or no dogs. 3/11/19. PICTURES Pups HERE. ****Due to thousands! of new inquiries a year for only 1-2 litters of puppies a year! I can now only respond, by PHONE, to people inquiring about Young Female, Current Available Adults, Breed Program, and ofcourse Past and Current Puppy Owners. I will announce when I have a Breeding and post here and take calls at that time. I have always tried to return every single call and didnt want to seem to be ignoring calls w/o posting here. Thank you for understanding.